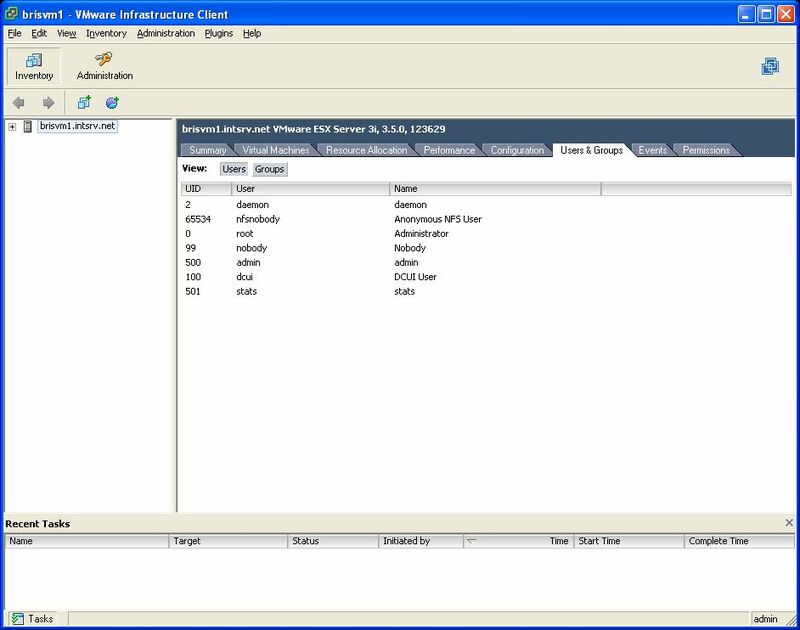 This method uses the VMWare Remove CLI tools to connect to the ESX server and download the information via an XML interface. Firstly download and install the VMWare Remote CLI tools to your Cacti server. 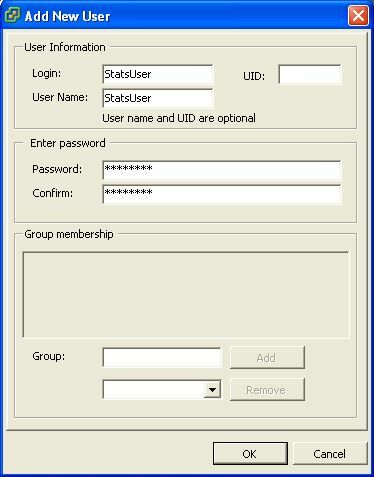 Next you need to add a user to ESX for the statistics collection. On the ESX Virtual Infrastructure Client goto the “Users & Groups” tab. Right Mouse Click and “Add” a new user. Then go to the “Permissions” tab, and Right Mouse Click to “Add Permission”. Add the new StatsUser and select Read-Only for the assigned role and click Ok.
Now goto your Cacti installation and copy the “esxstats.pl” file into your cacti scripts directory and import the “cacti_host_template_vmware_esxi_3_5_host.xml” file into Cacti using the web interface. These scripts can be downloaded from the bottom of this post. You should now be able to add a new ESX host into cacti. You will need to specify the “Downed Device Detection” mode to just “Ping” as there is no SNMP on the current Free version of VMWare ESXi 3.5. I am hoping that SNMP support will come to the free versions as that would make life much easier. This entry was posted in Cacti, Linux, Sys Admin, VMWare and tagged Cacti, ESX, ESXi, Graphing, VMWare by Jon Smith. Bookmark the permalink. Cheers, works a treat. Exactly what i was looking for. I really like Cacti, but this is one of my biggest bugbears. If you try to import a template on an older version you get the error stated above. The template should import on version 0.8.7d. What version are you using? is what i get, any suggestions? What is the version of ESX you are using? Free version or Licensed? Its the Free version, VMware ESX Server 3i, 3.5.0,153875 i can hit that url and its a rather short and sweet XML page. I’ve been scratching my head for a couple of days on it now. Mike, I have done some googling about your problem and it seems like you might be missing a Perl module. Try installing “Crypt::SSLeay”. Dead on, that was the hang up! Thanks so much, I thought I installed that module, but alas that was the issue. Great script, works perfectly and thanks again! To be honest I don’t know. In theory it should, it would be great if you could test it and let us know. I have just test on a ESX 3.5 Licenced version and it’s working fine. I have just test on a ESXi 4 version and it’s working fine. Hrm, new version of Cacti out. I will try the import after I have upgraded my installation. Once upgraded I will release a new version made for 0.8.7e, this wont be until early next week. Not currently. The last time I looked, this information was not easy to obtain. I loaded this using cacti 0.8.7e and it works. I did change the perl script to be more robust. I added functions for mem & cpu reporting on a singular vm or on the cluster itself, by passing command line arguments. I then re wrote the templates for mem & cpu to reflect this change. Any chance you would be happy to share your work back to the community? Sounds like a great improvement. BEGIN failed–compilation aborted at esxstats.pl line 7. Great job. Many thanks for sharing. Works fine on ESXi 4, monitoring from ubuntu. By the way, any one knows which ports on firewall should I open for this to work? Have you tested this on ESXi 5.0 and 5.1?